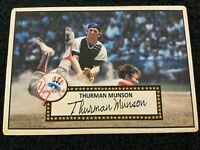 1972 TOPPS #442 THURMAN MUNSON IN ACTION PSA 8 NM/MT TOUGH CARD! ROBERTO CLEMENTE 1972 TOPPS Card #309 Beckett BVG 9.5 MINT Pop 1 None Higher!! !